The dive of the Malaysian Boeing from the sky above Donbas is a tragic and terrible fragment in the monster mosaic of the undeclared war of Russia against Ukraine. It is worthwhile to evaluate all parts of the chain of events to understand that this tragedy is not an accident, but an expected logical occurrence. The point is that after the end of the armistice in June and the subsequent effective actions of the anti-terrorist operation (ATO) in Donbas, Putin decided to rescue the situation at all costs. We, from the group IR, have been reporting that this was accomplished by the transfer of terrorists in Ukraine, not only of heavy weapons, but also of professionally trained crews and military units. By the way, even before the armistice, we were finding evidence of actions in Donbas by subdivisions of Russian Air Force. It is worth remembering, at least, the conquered by the forces of ATO in mid-June BM-21 and Putin’s ill-fated notebook, signed by the Chief of the Division, Captain D. Afanasyev and bearing the seal of the 18th National Guard Motorized Brigade of the Air Force of the Russian Federation. Currently, the Russian Ministry of Defense (MoD) claims that there is no evidence of Russian aggression in Ukraine. But the authorities in Moscow avoid comments on such facts. But these were the tulips. The strawberries popped-up after the ceasefire, when the delivery of weapons and equipment from the Russian Federation, along with permanent crew, was placed on the conveyor belt. Russia, despite of its endless space, could not find sufficient force of professionally trained mercenaries with narrow technical military specialties, able to operate complex military equipment. One cannot count at all on the local self-proclaimed militia, criminals and other scum. If some of them had served in the army, on still cannot count on them having the highest level of training. So, Russian professionals were sent in the battle. This was immediately felt by ATO forces. They noted everywhere the professionalism of mine handlers, snipers, combat crews and operators of anti-aircraft missile complexes (ZRK). Then, terrorists began to ask Putin for military specialists. Currently, Ukraine’s MoD reports that within Donbas terrorists have not conquered ZRK “Buk” of Ukrainian pro-Russian militia, which leads to the conclusion that it was transferred from Russian territory, as were earlier dozens of tanks, armored vehicles, jets, and rocket launcher systems (RSZO). No one doubts that separatists have “Buk”; they have actively bragged about it before the crash, and yesterday, the transfer of that ZRK to area where the Malaysian Boeing-777 was taken down was confirmed. 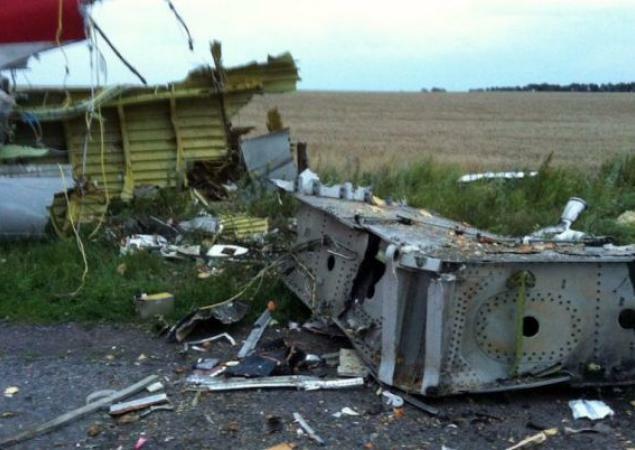 So, currently the question is where did terrorists receive “Buk” from and who was flying it? We have no doubt that the release was done by Russian experts. It was them exactly who had to complete the task in which local fighters failed – close the air corridor used by ATO to send supplies to their units operating near the border with the Russian Federation. As it is known, namely the Russian forces’ attempt to close this corridor ended being fatal. Instead of the expected by the fighters military-transport plane of the Ukrainian Air Force, they shot down a passenger airliner. And right there, the joy from hitting an An-26 was so inappropriate; they immediately began to inform terrorists, which delighted Russian media. The subsequent whining denials by separatists, backed by vigorous Russian propaganda, only proved once again that we are dealing with a narrow-minded, quite sneaky and extremely slick opponent. Act as real men and confirm what stirred such joyful noise about half an hour ago! No, once you realized what you took down, you began a desperate attempt to wiggle out, trying to insinuate that Ukrainian forces brought to their border their “Buks”. And that someone saw there how a Ukrainian “SU” is shooting down the airliner and this was a Ukrainian attack. The stupid criminal is always distinguished by the fact that he finds many excuses for his actions, including mutually excluding ones. He believes that the more different arguments and excuses he has, the better. The smart criminal adheres to only one version. In a way, we are lucky that we are dealing with such unintelligent opponent; currently the failure and deception of the pathetic attempts of separatists, together with Russia, to justify themselves are obvious to the whole world. And this is also evidence of the responsibility of the pro-Russian terrorists and of Russia for the tragedy that happened in the sky over Donbas. The most important issue today is to carry out an objective investigation. From the beginning, Moscow declared it wanted to take this job and terrorists said they would pass there the black boxes found at the crash site. Interestingly, the so-called First Deputy Prime Minister of the Donbas People’s Republic, Andrei Purgin, said he will deliver them for examination in Moscow because high-class experts were working there and they were be able to establish the exact cause of the crash, although it is already obvious. Well, how come terrorists do not know the cause of the crash? This seems strange from another angle as well – from what joy, Russia, which ardently denies its relationship with terrorists and has accused Ukraine of the tragedy, is now going to deal with the investigation? And since no Russian citizens have perished? But Kremlin realized in time that, really, rushing to conduct the investigation looks suspicious. Therefore, the Russian Federation requested an investigation by international entities. This was announced personally by Foreign Minister Sergei Lavrov. Attention, however, must be focused not on those showing suspicious flexibility, but on the parallel statement of terrorists that they do not intend to stop fighting during the investigation of the incident. In their address they say its location is in their deep rear and there is no need whatsoever of humanitarian cease-fires or corridors. Along with that, the State Emergency Service of Ukraine said that the search work is difficult because of the presence of armed separatists who impede the activities of our divisions. This means that the fighters, on the request of Moscow, are trying to cover-up all traces of the crime. At night, we established that ZRK “Buk”, which presumably shot down the airliner, was transferred to the border with the Russian Federation and we will find out soon if it is on Russian territory. The only thing they have left is to clean the scene of the incident. Consequently, we must understand that black boxes will not provide the needed information. To make conclusions on how the plane was shot down, the minimum necessity is to find the affected parts of the plane. If the weapon used to commit this crime, such as the ZRK, and the debris of the aircraft are to be hidden, the investigation will reach a dead-end. Are these criminals going to avoid responsibility? I’m sure they will not – there is direct evidence of the crime, there is also evidence from satellite observations. At least, they will clearly prove that the launch of the rocket was not produced on the territory controlled by the ATO forces of Ukraine. In any event, there is hope that the perpetrators of the tragedy will not escape responsibility before the global community. And a few words about indifference. I am very certain that some part of the responsibility for this tragedy rests on the shoulders of European leaders. In the case of the aggression of Russia against Ukraine, they were attracted way too much to money calculations, forgetting that the world is a very tiny and fragile place. They forgot how small Europe is and that it is impossible to have just one country being the victim of aggression and burning in war, and the others to think that it does not concern them. If the EU had moved at least a finger to prevent the aggression of Russia against Ukraine; if instead of mulling things, it introduced meaningful penalties, as promised in March, and forced Putin to stop initiating terror in Donbas, this tragedy would have been prevented. I am deeply convinced of that. And if you, gentlemen European officials and politicians, are not bothered by the daily doom of my brothers-Ukrainians, maybe this tragedy will wake up your conscience as these are your own citizens – at least for the sake of those civilian children who became innocent victims, including of your indifference?